D. of Somerset's Lands, Lord Willoughby. 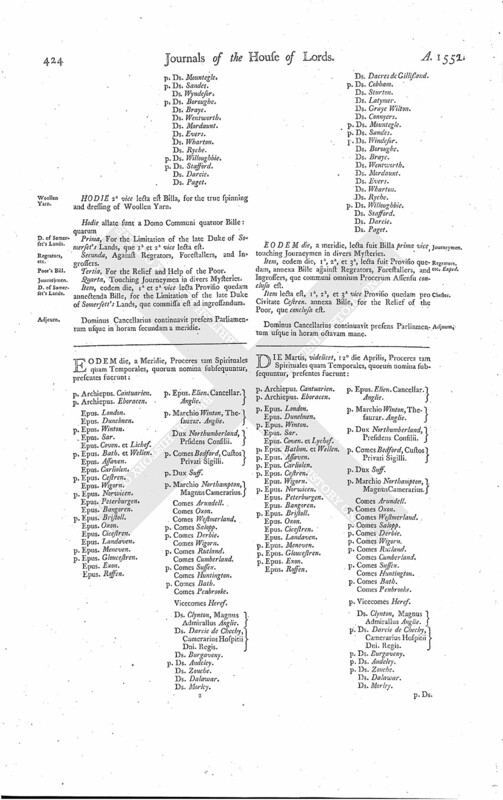 Bill of Attainder of D. of Somerset, and others. HODIE 2a vice lecta est Billa, touching Journeymen in sundry Mysteries. 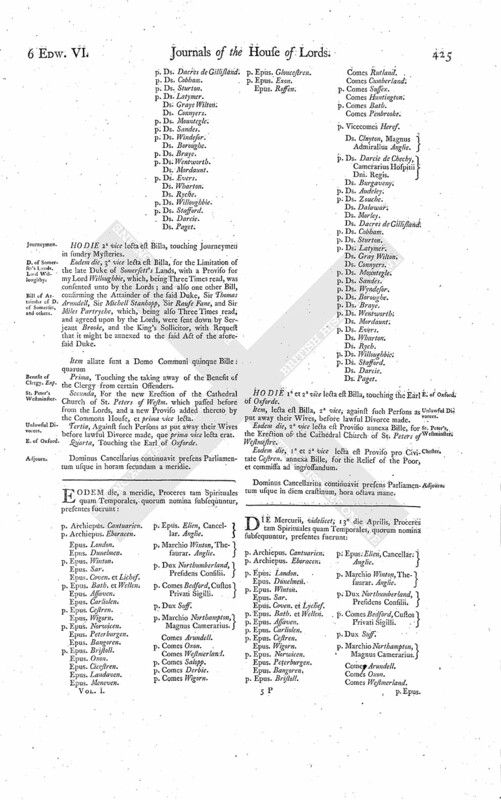 Eodem die, 3a vice lecta est Billa, for the Limitation of the late Duke of Somersett's Lands, with a Proviso for my Lord Willoughbie, which, being Three Times read, was consented unto by the Lords; and also one other Bill, confirming the Attainder of the said Duke, Sir Thomas Arundell, Sir Michell Stanhopp, Sir Raufe Fane, and Sir Miles Partryche, which, being also Three Times read, and agreed upon by the Lords, were sent down by Serjeant Brooke, and the King's Sollicitor, with Request that it might be annexed to the said Act of the aforesaid Duke. Prima, Touching the taking away of the Benefit of the Clergy from certain Offenders. Secunda, For the new Erection of the Cathedral Church of St. Peters of Westm. which passed before from the Lords, and a new Proviso added thereto by the Commons House, et prima vice lecta. Tertia, Against such Persons as put away their Wives before lawful Divorce made, que prima vice lecta erat. Quarta, Touching the Earl of Oxforde. Dominus Cancellarius continuavit presens Parliamentum usque in horam secundam a meridie. Ds. Clnyton, Magnus Admirallus Anglie. HODIE 1a et 2a vice lecta est Billa, touching the Earl of Oxforde. Item, lecta est Billa, 2a vice, against such Persons as put away their Wives, before lawful Divorce made. Eodem die, 2a vice lecta est Proviso annexa Bille, for the Erection of the Cathedral Church of St. Peters of Westmestre. Eodem die, 1a et 2a vice lecta est Proviso pro Civitate Cestren. annexa Bille, for the Relief of the Poor, et commissa ad ingrossandum.